Stuttgart, a city of Germany, capital of the kingdom of Wurtemberg, 2 m. S. W. of Canstatt on the Neckar, and 97 m. S. E. of Frankfort; pop. in 1876, over 107,000, including 9,000 in several villages. It stands in a very beautiful valley surrounded by vine-clad hills, with wooded mountains in the distance. The town is generally well built, and is divided by the long Konigsstrasse, the principal street, extending nearly N. and S. throughout its entire length, and bordered by the chief business buildings. In the principal square is a fine old Gothic church, with a high tower and many ancient sculptures and monuments of the princes of Wurtemberg. The royal (formerly ducal) palace, begun in 1746 and finished in 1806, is a large building of freestone finely decorated and furnished in the interior; the old palace, completed in 1570, resembles a mediaeval castle, and is now occupied by officials connected with the government. In the same square is a monument to Schiller by Thorwaldsen. The hospital church is a Gothic building, finely decorated in the interior, and contains the original model of Danneck-er's " Christ." The town hall was built in the 15th century. There is a museum of natural history; a royal library of 450,000 volumes and 3,500 manuscripts; a cabinet of medals containing more than 17,000 specimens; a museum of the fine arts, with many valuable statues and pictures; a bazaar, and a theatre. Stuttgart has also a gymnasium, military academy, polytechnic school, a royal school of art, attended in 1874-'5 by about 100 students, and a conservatory of music, attended in January, 1875, by 576 male and female pupils, including 79 from the United States and 53 from England. The manufactures include woollen, silk, linen, and cotton goods, jewelry, musical and philosophical instruments, leather, and tin ware. The book trade is extensive, and connected with it are numerous paper mills, type founderies, and lithographic establishments. The town is the central point of the Wurtemberg railways, seven lines extending from it; and the railway station is perhaps the finest in Germany. There is a horse railway between Stuttgart and Canstatt, a pleasant suburb and favorite summer resort. Besides the public garden, which is one of the finest in Germany, there are in the vicinity numerous parks and gardens, where the public are admitted; that of Rosenstein, the king's summer palace, and the gardens of the Wilhelma palace at Canstatt, are the most beautiful. - The date of the foundation of Stuttgart is not accurately known. 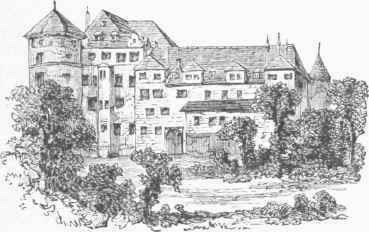 It is mentioned as early as 1229, and was selected as a residence by Count Eberhard in 1320. In 1482 Count Ulric made it the capital of Wurtemberg. The city had little of its present beauty until the middle of the 18th century; after that time it was greatly improved during several successive reigns, owing its chief embellishments to Kings Frederick and William. The population and prosperity of Stuttgart have of late much increased. - See Wochners Stuttgart seit 25 Jahrcn (Stuttgart, 1871).